Wool paintings make charming wall decorations and unique handmade gifts. Painting with wool fiber is one of fun craft ideas for adults and kids that celebrate the beauty of this natural material. You need just few wool rovings or yarn skeins in different colors for creating beautiful winter landscapes or your favorite animal portrait. Winter is the best time for enjoying warm wool fiber. Making unique handmade gifts and designing wall decorations with wool fiber are great craft ideas for adults and kids that unleash creativity, demonstrate talents, add soft wool texture, warmth and attractive colors to your room decor. 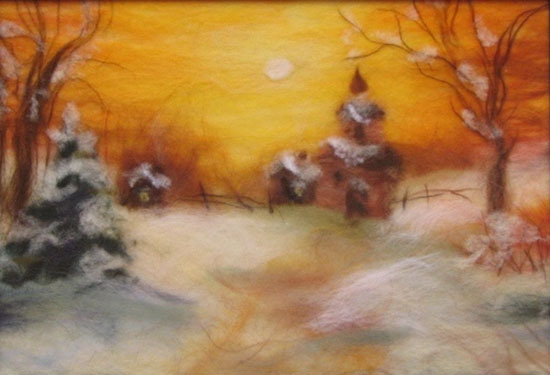 Painting winter landscapes with wool is a nice way to enjoy charming season and decorate your home for Christmas and winter holidays with a unique handmade wall decoration. 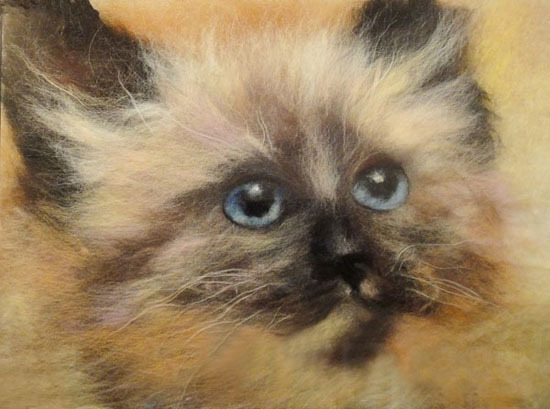 You can use silk, cotton or wool fiber, feathers, cotton balls and felt for making charming wool paintings for wall decor or very special handmade gifts for your family members and friends. Wool paintings are wonderful, beautiful and inexpensive wall decoration ideas that dramatically transform your room decor, adding wool art pieces and bring more joy and warmth into your busy life. Velvet and flannel, bamboo and cotton fabrics and even soft paper work well for making artistic handmade gifts, greeting cards or wall decorations. Natural materials, such as dry grasses and leaves, thin twigs and dried rowan berries can be added to your wool paintings and eco friendly craft ideas, making them look impressive and colorful. You can start wool painting by preparing wool, taking small chunks of a roving and delicately pulling them apart, so wool becomes fluffy. 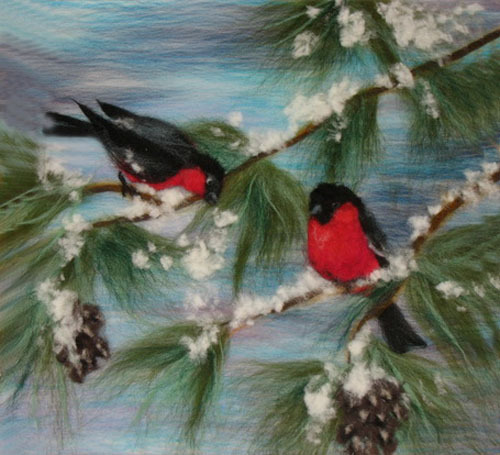 Choose a simple winter scene that you like for your first wool painting. The main thing is not to be afraid of experimenting with new techniques, using natural or eco friendly materials and new creative craft ideas.